Whether you are looking for a romantic getaway, a respite from a busy professional life, or a way to celebrate that special occasion, our one-bedroom villa is a perfect choice! Use of 'RUBY," our electric golf cart is complimentary throughout your stay and is a wonderful way to see Fripp. In addition to stunning views of the Atlantic, we offer a level of luxury and attention to detail not found in most vacation rentals. Our elegant furnishings, original artwork, and ideal location have been chosen with care and will definitely help you feel pampered and special throughout your stay. Weekly rates are $1300 plus taxes in spring and fall/$1600 plus taxes in summer. Rates do not include guest club cards which can be purchased from owner. Rates DO include cleaning fee and use of golf cart. A discount is given for guests who stay multiple weeks. Enjoy a week (or two or three!!!) of total relaxation while you take in some great views of the ever-changing and beautiful Atlantic Ocean. Sunsets, sunrises, and dolphins are plentiful as you relax in our comfortable rockers, sipping your morning coffee or favorite evening cocktail. Plum retired as an independent contractor (East Lansing, Michigan) and Jeri retired from her 35 year career in public education, most recently as a school principal (Okemos, Michigan). Until retirement, we enjoyed Fripp during Jeri's school breaks--renting our home to guests when we were not able to be here and longing for the day when we could spend additional time at Fripp. Over the years, we have loved hearing from guests about the things they enjoyed about our villa and Fripp Island. With retirement, we now spend winter months at Fripp and continue to enjoy sharing our 'southern home' with guests who want an upscale, beautifully furnished and well-maintained vacation home. Nearly two-thirds of our guests are returning visitors to our villa who say that they appreciate the luxury and attention to detail that we provide! As our guests, you will always enjoy the quiet beauty and peacefulness of Fripp, including the beach, two on-island golf courses, tennis courts, walking and biking paths, and many on- and off-island attractions. Our rental rate includes all linens and departure clean. South Carolina tax (11%) and optional Fripp Club amenity cards are extra. The purchase of amenity cards entitles you to 'guest membership' in the private Fripp Club, including use of all club facilities (e.g. golf courses, restaurants, fitness center, pools, and tennis courts). Amenity cards must be reserved at least one week prior to your visit. Cost for amenity cards from Memorial through Labor Day is $50 per person per week. Cost during the 'off season' is $35 per person per week. Special Notes: Our goal is to ensure the highest level of quality for our guests. Therefore, our villa is designed and furnished for adults and not equipped or decorated for families with young children. We rent only by the week (Sat. to Sat.) and do not allow smoking or pets. Maximum occupancy is two people. When we are not at Fripp Island, we maintain a year-round home in mid-Michigan one mile from the campus of Michigan State University (Go Spartans!). Plum is a retired building contractor, and Jeri is a retired school principal. We both love splitting our "home" time between Fripp Island and Okemos, Michigan. A passion for both of us is the game of golf which we love playing together and with friends. While at Fripp, we enjoy walking Fripp's beautiful beach, socializing with friends, and exploring Beaufort's many art galleries and boutiques. Plum loves outdoor activities, including golf, surf fishing and crabbing. Jeri is an active volunteer (has worked at Beaufort Art Gallery, St. Helena Elementary School and as a volunteer in the Newhaven complex). She also enjoys participating in competitive state and 'low country' golf tournaments. We love to travel, spend time with friends, and do things with each other in retirement. We have traveled throughout Europe, Mexico, Greece, Alaska, and the Caribbean. We look forward to sharing our villa with guests during spring, summer and fall months!!! We fell in love with Fripp on our first trip to the 'Low Country' in 1997. After visiting friends at their beachfront home, we knew immediately that Fripp was a special place that where we wanted to spend more time. We enjoyed shelling, kite flying, crabbing, surf fishing, golf, and more on that first trip. After only a week, we purchased a villa here and never looked back! We bought our villa in Newhaven because we love its beautiful ocean views and friendly community spirit. The quiet laid-back "natural beauty" of Fripp captivated us on our first visit. It still enthralls us over twenty two years later! When we get the urge to “get off the island,” we enjoy visiting Bluffton, Hilton Head, Savannah, and Charleston. We ALWAYS love our nearby town of Beaufort which is one of the quaintest and most friendly small towns in America. We enjoy so many things about Fripp--meeting interesting and accomplished people from all over the U.S. and world, observing brilliant starry nights, taking beach walks together, teeing up on the first hole just across the street from our villa, and driving our golf cart (Ruby) on rides to see the island's abundant wildlife. We fell in love with Fripp on first sight and continue to love it more each year--a beautiful Audubon nature preserve featuring deer, egret, eagles, alligators, osprey, and dolphins. Best of all, we love the many friends we have made over the years and enjoy our reunions as we return each fall to our beautiful and secluded island paradise! Guests staying at our villa will find our villa unlike 'typical' rental properties. Some unique benefits: Luxury and Quality: We maintain our villa to the luxurious standards that we want for ourselves--with upscale furnishings, original artwork, and unique accessories--as well as focused attention to all the details that we--and our guests--wish for on a memorable trip. Special Setting and Location: Our unique location gives guests a short walk to golf, pool, beach, and dining--without ever getting in a car. With our villa facing south on the Atlantic Ocean, you will have gorgeous views of the water and wildlife. A glass of wine or cup of coffee while relaxing in our rockers mellows out even the busiest professional. Watching dolphins frolic and shrimp boats head out to sea are simple pleasures that can make your day a great one. Nearby History and Adventure: When you get the urge to leave the island for adventure outings, the unique history of the Low Country is just a short drive away. Beaufort, Savannah, Hilton Head, and Charleston provide day trip opportunities to experience culture, history, and the arts. From quiet and relaxing to educational and exciting, our location really has it all! Garden tub is great for relaxing and soaking! Professional hair dryer, flat iron and curling irons are provided. Bathroom features ceramic tile and high quality bath linens. Optional Guest Club Cards entitle you to membership in the private Fripp Club, including use of all resort amenities--pools, tennis, golf, fitness center, and restaurants. Villa has ocean views from almost every window with water so close you can see dolphins swimming by. The large ocean viewing deck is great for socializing, reading, & watching sunrises and sunsets. Enjoy fishing, kayaking, crabbing, shelling, and swimming just steps from your living room door! Three landline telephones (kitchen, living room and bedroom), plus answering machine. All bed and bathroom linens are luxury quality and new. Covered private parking space is provided for guests. Parking is underground and island security patrol is in place. Underground parking garage with designated parking space for guests. Towels are luxury quality and new. Extra linens included for all guests. Fitness center is available for guest use upon purchase of club amenity cards. Secure wireless internet access in villa. Password provided to guests. Villa is on ground level of a 3 story building and is easily accessible. Covered parking is available, and an elevator provides easy access for luggage and groceries. Living room has incredible ocean views and Tommy Bahama Sunbrella fabrics and island style furnishings. Glass slider door opens onto private patio area with high quality polywood chairs. In-kitchen eating area features space for dining and computer set-up. Side by side 26 cu ft. GE refrigerator with ice and filtered water dispensers. Smooth-top stove features Quick Boil and warming burners. Oven features Quick Bake and convection settings. New appliances, and granite counters and glass tile backsplash. Mr. Coffee 12-cup Coffee Maker. A selection of spices, rubs, and seasonings is provided. Variety of placemats, cloth napkins, and candles offer opportunities for fine dining experience with ocean views!!! High quality dinnerware and silverware, stemmed and stemless crystal wine glasses, martini glasses, assortment of Tervis tumblers, high quality cookware & baking dishes, unique coastal serving dishes. Dining area is open to living room and has beautiful ocean views while dining! Furniture is comfortable and luxurious island style with glass top dining table. 55 inch 4K HD Samsung TV in living room is new. Mounted 32" flat screen tv in bedroom is new. (2) Flat screen TV's located in living room and bedroom. Both tvs have comcast cable. Bose stereo system with multiple CD changer is provided. Some books, including cookbooks and light reading materials, are provided. A variety of puzzles and games is provided (dominos, Left-Right-Center, monopoly, etc.). A collection of CD's) (classical, easy listening, and opera) is provided. A variety of popular movies is provided. Sunken outdoor garden area features a grills and seating, as well as a variety of beautiful southern plantings. Rental of kayaks can be done through Island Excursions, located at the Fripp Marina, approximately three miles from our villa. Bicycle rentals can be done through Island Excursion (recommend advance reservation as quantities are limited). Bike racks are provided in parking garage. Private patio has comfortable chairs overlooking ocean. An expansive communal ocean viewing deck is also right out your door and features chairs and tables. Eight tennis courts are available w/purchase of Fripp Club Guest Carts. They are located approximately two miles from our villa. Two golf courses are available w/purchase of Fripp Club Guest Cards. One course is just across the street from our villa. Both courses offer a driving range and putting green. Purchase of club amenity cards entitle guests to use six pools located throughout the island (Ocean Point Pool is located right next door to our complex). We provide a level of luxury unmatched in most vacation rentals. Enjoy ocean views from every window while relaxing in our vacation villa and on our beautiful patio or ocean viewing deck. Coastal furnishings, original artwork, unique accessories and incredible views---you CAN have it all!!! We provide beach chairs, towels, and an umbrella and allow renters to use 'Ruby’, our personal electric golf cart (a value of $350 per week). A Bose sound system and extensive collection of music is provided. A video library and assortment of games and puzzles are also provided. Storage area available for bikes. Purchase of amenity cards entitle guests to all privileges of the Fripp Club, a private club with tennis courts, restaurants, golf, and pools. These cards ARE necessary to use club facilities. The beach and ocean are just steps from our villa which features incredible views from every room. Our interior is updated and luxurious with everything you need for a wonderful week. While staying at our place, you can enjoy the many activities offered on Fripp and the nearby area! Explore the island in "Ruby," our electric golf cart (included with rental) or walk and bike the beach and hiking trails. Bird watching, shelling, and reading in your private deck chairs are just a few of the relaxing activities on Fripp. Many guests also enjoy exploring nearby the quaint town of Beaufort which has been named "Best Small Town in USA" by Southern Living magazine. Savannah & Charleston are close by if you want to check out historic sights, sample southern cuisine, and visit small galleries and shops. Many of our guests enjoy visiting plantations, checking out "ghost tours" and "culinary tours", visiting Fort Sumpter, the Citadel, and doing carriage rides to learn about southern life. Our villas’s incredible ocean views invite you to pick up fresh seafood at the local fish docks (featured in the movie Forest Gump) & 'cook in'. Foodies may want to venture out and try some of the area's delicious restaurants which feature local produce, seafood, and recipes. Fripp boasts excellent tennis courts, as well as two highly rated golf courses--Ocean Point and Ocean Creek Golf Courses. As a special 'bonus', you may choose to purchase amenity cards that entitle you to 'guest membership' in the private Fripp Club & use of ALL Fripp Club facilities, including tennis, pools, and dining. 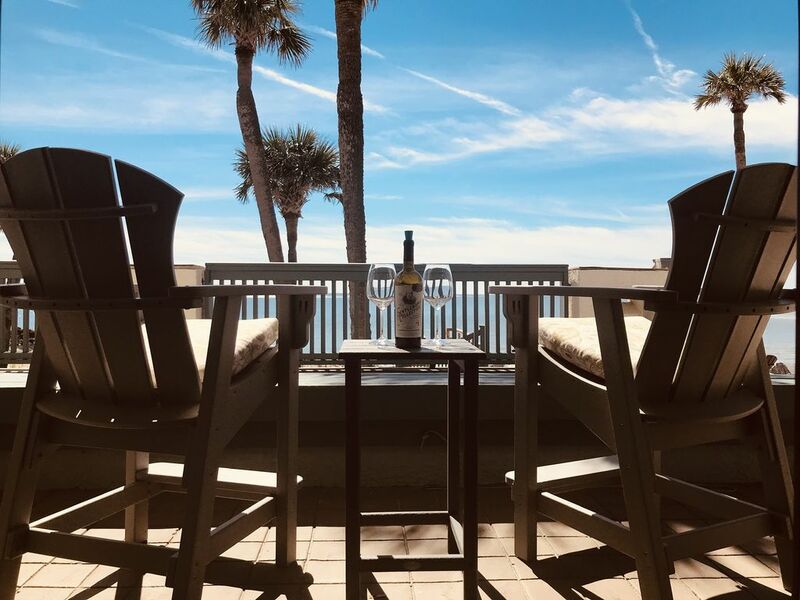 Whether you choose this option, or merely want to relax and enjoy the beauty of Fripp, we guarantee your vacation will be among your best ever!